SoundBlocker Quilt SBQ2 is a superior alternative to acoustic mineral wool insulation and an improved version of our normal SoundBlocker Quilt (now discontinued). This new and superior sound absorber/barrier offers better sound proofing than normal mineral wool and is the preferred choice for installation between joists when soundproofing a floor wall or ceiling. SBQ2 sound insulation will also give enhanced results if used as the acoustic infill when soundproofing stud partitions. Soundblocker Quilt SBQ2 has been reformulated and improved to provide a superior laminate of a combination of fire resistant mineral wool sound absorption and its unique recycled sound blocking membrane core. Ideal for soundproofing walls, floors and ceilings. Unlike normal sound absorbing mineral wool, due to the sound blocking membrane sandwiched within the product, it will help to block noise as well as absorb it. Using this quilt will enhance the soundproofing of any structure where it may be used instead of normal mineral wool. SoundBlocker Quilt SBQ2 consists of a laminate of 25mm sound absorbing mineral wool, high density acoustic membrane and another layer of 25mm sound absorbing mineral wool. 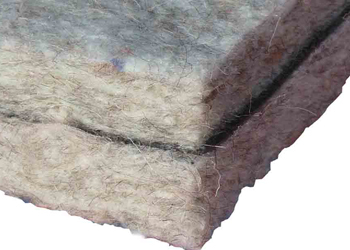 It performs up to 4 times more efficiently than normal Mineral Wool infills due to the unique barrier layer sandwiched in the middle which helps block airborne noise in the same way as lead. The Quilt exceeds the new Part E Resistance to the Passage of Sound when used in conjunction with other soundproofing materials for separating floors and walls making it the preferred product of high end architects and installers. When used as the acoustic infill, SoundBlocker Quilt SBQ2 can uprate a typical 12.5mm plasterboard clad stud wall by up to 16dB! SoundBlocker Quilt SBQ2 can also improve the sound insulation of a suspended timber floor by up to 13dB!